There’s Wonder Working Symbolic Power in the Blood? Home / thinking / bible stuff / There’s Wonder Working Symbolic Power in the Blood? Human history, evolutionary history, Church history and the story of Jesus is packed full of violence. Christians have acted violently on behalf of God and for many Jesus took on the violence of God for us. The violence of the cross can and should make us a bit skweemish – yet the Gospels are focused on the cross and Paul can’t stop talking about it. If you grew up in a Baptist church like me you know a whole bunch of cross and blood songs (like Old Rugged Cross…my rendition) and the blood of Jesus had a piety all its own. Sometime in college, after sitting through the The Passion of the Christ, I got rid of all the blood talk, blood singing, and just tried to avoid all the Good Friday bloody violence. 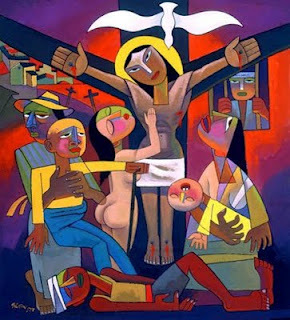 Then Andrew Song Park, James Cone, and Paul Tillich re-enchanted the blood of Jesus theologically. Now there is a wonder working symbolic and prophetic power in the blood I don’t want to give up….some days. Why is it that I desired to cover up the blood of Jesus, to deny it theological power? Mostly it had to do with the image of a blood requiring Father who fulfilled the requirement through Jesus. I have no interest in articulating a theology where there is a dichotomy of character and intention between the Fatherly Mother and her eternal Son. God was either as good as Jesus said God was or I could just as well join Jesus and Job’s protest. IF Jesus was in fact the image of the invisible God, if the Son who was sent shared and communicated the heart of God, then it was theologically problematic to let a bad atonement theory introduce an ethical dichotomy between the two. I believed that (and still do) so I got rid of the blood. But what if the blood needs to stay for another reason, one that coheres with the ministry and message of Jesus as well as God’s desire for more just creation? It was James Cone who impressed that quest upon me. During lent of 2009 I decided to take up reading only African American theologians and by the time I was done I began to see that in running away from the blood of Jesus I was running away from a symbolically powerful place for the Black church and, more importantly for a white-straight-middle class-dude like me, the ever-present reminder of God’s cross-bearing, blood spilling confrontation with with cross-building powers of this world. In silencing the blood of Jesus I was not just avoiding a problematic atonement theory but God’s demand for justice that streamed from the body of my Lord. Trying to figure out exactly how I could theologically reclaim the blood of Jesus wasn’t easy. Paul Tillich’s differentiation between signs and symbols became an extremely helpful tool. For Tillich religion expresses itself in symbols, they are contextual and finite. A symbol lives where it serves to breakthrough the conditioned reality of the religious community and confront its inherited assumption about the world. A symbol is a living symbol as long as it continues to participate in the Unconditioned and rupturous reality which gave it life. For me the blood of Jesus became a sign, it didn’t participate in my own experience of God but pointed to a rather depressing image of a God I couldn’t worship, and so I let it go. After engaging Cone, the blood of Jesus began to speak to me again – it confronted many of my own practices, my assumptions about the world, my unexamined privilege, and the coercive system that preserved them. Cone had pricked my imagination and what use to be a sign pointing to a depraved atonement theory became a symbol for the power-threatening gospel of the crucified one. For the oppressed, Jesus’ blood as a symbol participates in the agony of their suffering under the unjust persecution, exploitation, oppression, and violence…his blood signifies the intermingling of God’s woundedness, sorrow, grief, and God’s never-ending hope for the downtrodden. Jesus’ blood represents God’s pierced heart for the sinned-against. It was Andrew Sung Park who helped me piece everything together, it was his work on atonement that took this retrieved and revived symbol and made it sing. Park was able to expand the symbolic power of the blood to all creation, adding an ecological flare, but he was also rather brilliant at pointing out the conflicted nature of ourselves. We are all both oppressed and oppressors. Not in the same way or even symmetrically but it was Park who insisted that the blood of Jesus is for all creation’s wounds – including mine – and a protest to all of our wounding – including those I participate in structurally and those I inflict upon others. The blood of Jesus insists on God’s Holy Justice, God’s participation and sharing in the wounds of all, God’s protest with and on behalf of the wounded, God’s promise but not yet accomplished healing, God’s insistence on a fleshly and material Gospel, and God’s decision to take the side of the wounded – the wounded in all of us. The blood of Jesus is a symbol of the God who is for us, beside us, and working through us to bring healing. Today is Good Friday & thanks to this little theological journey of mine I will sit down tonight after everyone is asleep, smoke a delicious cigar and listen to Gavin Bryars & Tom Waits ‘Jesus Blood Never Failed me Yet.’ Check out the story of the recording here.